While inspecting my new roller and getting it ready for the engine installation I found the brake master cyl leaking. The reservoir is almost empty. 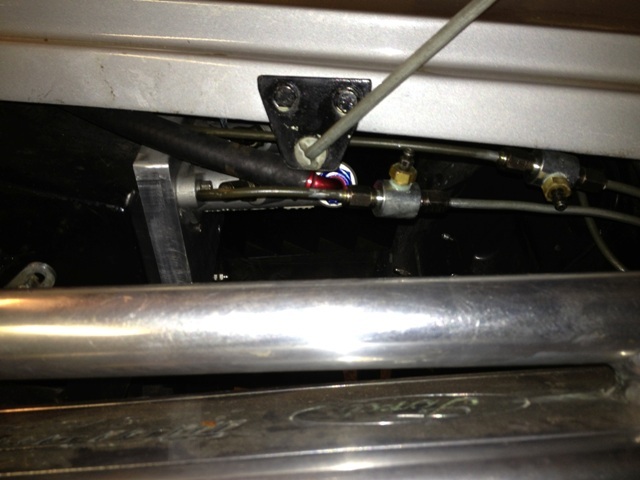 Fluid seems to be leaking at both of the rubber seals between the reservoir and master cyl it is mounted on. I’m thinking I need a new master cyl. All of this is tucked under the left front fender. Does anyone know if the master cyl can be removed from the booster with the booster in place? There isn’t much room to slide the master cyl forward. I had the same problem with 3153. I ended up using hose barb to AN adapters and going with reproduction Girling resovoirs for both the brakes and clutch, mounted to the firewall. To answer your question, yes, it can be removed without removing the booster. There is an access panel in the fender well for this but it's still a chore. Good luck. BTW, it's not your MC, it's the fit of the res barbs in the grommets. This problem was reported long ago to Hillbank, doesn't seem to have helped. res barbs in the grommets....??? Reservoir barbs into the rubber grommets of the master cylinder, loose fit allowing leakage of the brake fluid from the reservoir. Only a problem if you like to be able to stop. I built it all. (This is my second iteration) I used the stock SPF pedal and welded in a wildwood balance bar tube with some extra bracing added, the aluminum mounting plate puts the M/C’s at 60 degrees and uses the factor mount holes plus a couple extra. However, the fiberglass foot box wasn’t designed for this amount of load, so there is still flex. My newest version is underfloor, hydroboost, dual M/Cs with a balance bar. Last edited by D-CEL; 04-15-2019 at 08:59 AM..
Nice Work! You'll have the best stopping cobra around if you keep that up!